Today began with a journey to the market for our weekly shop. This is incredible boring except for the fact that in our nine year relationship we've probably only been shopping for groceries together about a dozen time. This is probably for the best seeing that our strategies for grocery shopping are wildly different. I like to think that my style is extremely efficient and organized. Jen, on the other hand, is content to spend 60% of the time shopping pondering the various merits of one laundry detergent versus another. This one is more expensive but does more loads. That one smells better than this one. This fabric softener has bergamot root while this one has eucalyptus. Luckily we're compatible on many other levels because grocery shopping is not the area where we are most in sync. It's like I'm MC Skat Kat and she is Paula Abdul. Later that day I started up the grill and grilled up a mess of vegetables including these beautiful spring onion that I served over mixed greens. 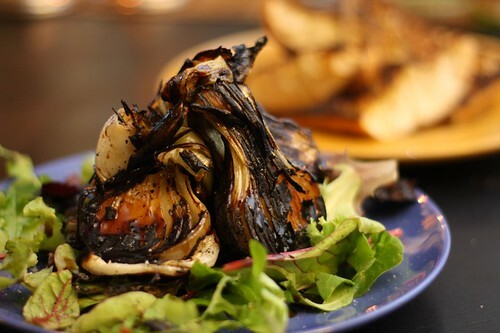 I drizzled them with a little balsamic glaze and served with some grilled ciabatta with olive oil, salt, and pepper. I then rubbed the ciabatta with a garlic clove. The onions were beautifully cooked. One unexpected delight was that the mixed greens had a little dill and cilantro tossed in with them and this was a surprisingly tasty match with the onions and balsamic glaze, going against all culinary logic. Don't believe what they teach you in culinary school, ladies and gentlemen. While the grill was going I also grilled some fennel, red pepper, yellow pepper, asparagus, graffiti eggplant, and zucchini. 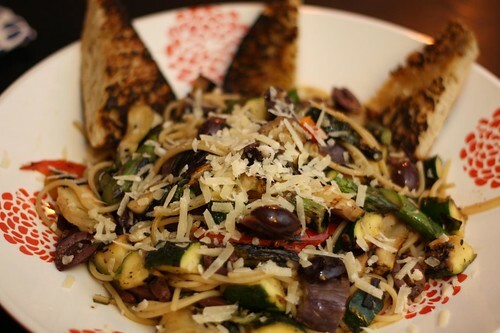 Jen made the pasta dish, throwing the freshly grilled vegetables into a pan with olive oil and garlic, then tossing it all together with cooked spaghetti, fresh basil, kalamata olives, some butter, and a little lemon. We served it up with the remaining grilled ciabatta and some grated Parmigiano-Reggiano. 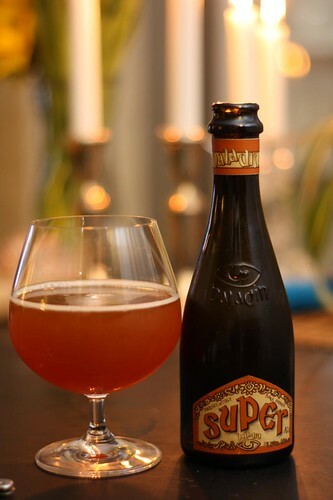 For beer I enjoyed this beer called Super Baladin we picked up last weekend at Eataly.. I imagined this was like some sort of Dungeons & Dragons inspired beer. I guess that's only because I thought "baladin" was Italian for paladin. I was disappointed to learn that this was not the case. However, when I learned that it was sort of Italian for Belgian Ale all was forgiven. However, if we are forced to fight a chromatic dragon this beer is going to come in less handy than I'd originally thought.